The carrier of the oral tradition for this Spencer ancestry is Audrey Mae (née Spencer) MacDonald. Audrey Mae Spencer was born on March 19, 1912 at the Spencer Homestead on Middle Road, just east of the Spencer Family Historical Cemetery(No. 9), in East Greenwich, Rhode Island. 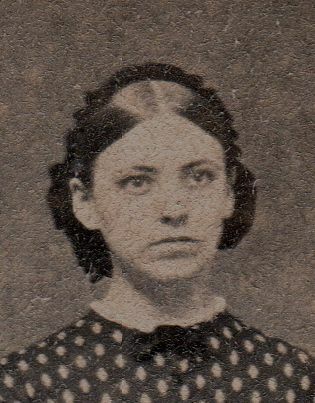 She was the third child of Mary Jane Vaughn and William J.B. Spencer. Audrey had an older sister, Edith Anna, and an older brother, John Edward Spencer. Audrey was named after her great, great, great, great, great, great, great (7 times) grandmother Audrey Green who married John Spencer, the son of Susannah Grifﬁn and John Spencer (who was granted land by the King of England when East Greenwich was incorporated in 1647). Audrey Mae was intermittently interviewed between June of 2002 and March of 2007. What were you told about your grandfather, John Johnson Spencer, who was a prisoner of war? Audrey: John Johnson Spencer was a union soldier. He was captured and was at Libby Prison where he had to eat raw pork and he had an upset stomach for the rest of his life. 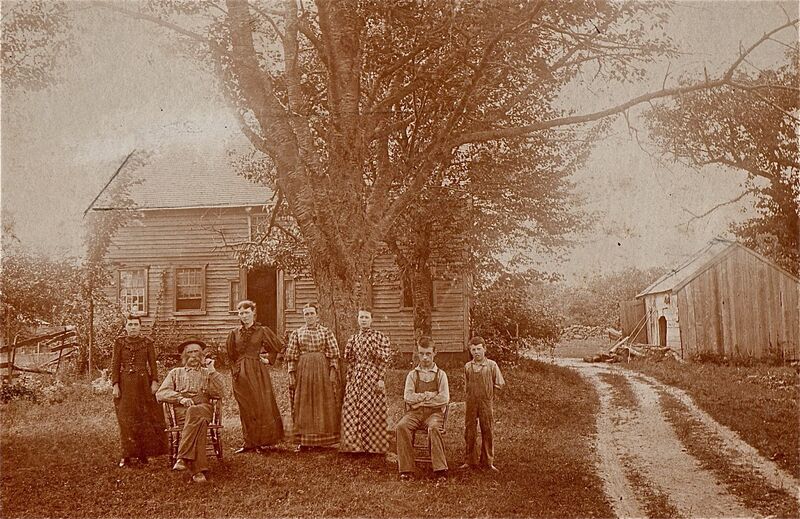 How did you know so much about your ancestors? Audrey: Aunt Mandy, Deacon Richard Anthony’s daughter, told and wrote down much of the Spencer family history. She put a date on every paper. The house on Spencer’s Corner (the corner of Division Street and Crompton Road in East Greenwich, Rhode Island) descended to Deacon Richard (Richard Anthony “Deacon”) and then to his descendants. This house on Spencer’s Corner was where John Johnson and Anna Maria Spencer’s three sons – William J.B. Spencer, Alfred Ernest Spencer and Richard Augustus Spencer- were born. 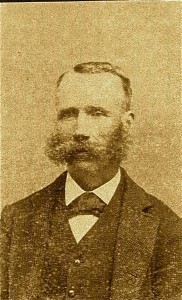 William J.B. Spencer (Audrey’s father) was sent as a young boy to live and work the farm with his great-uncle Gus (William Augustus Spencer) at the Spencer Homestead on Middle Road. 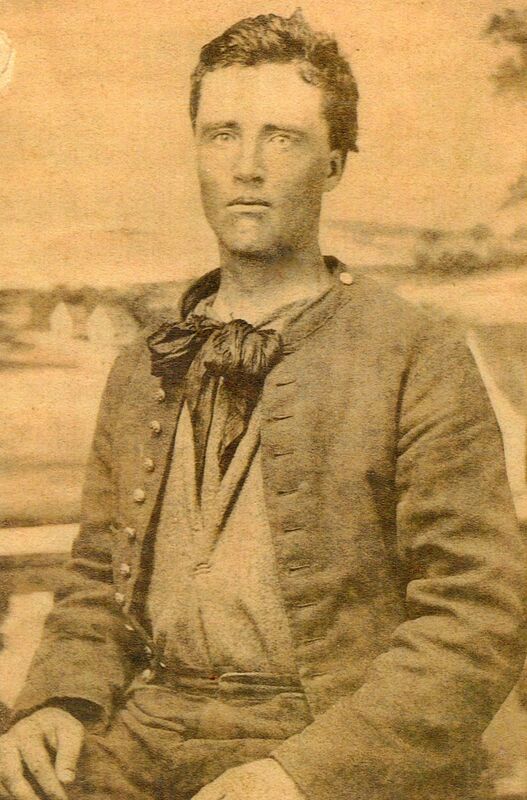 Uncle Gus had no sons, so William J.B. Spencer was to inherit that homestead on Uncle Gus’s death. Uncle Gus died when Aunt Edith (Edith Anna Spencer, Audrey’s older sister) was two years old. I remember my grandfather, John Johnson Spencer living in our household when I was a child. Tell me again about your grandmother, Anna Maria [Anna Maria Spencer] and your grandfather, John Johnson Spencer. Audrey: Richard Spencer, (Audrey’s paternal great,great-grandfather) and Roby (née Tarbox) had seven children. Their youngest child was Esther Amanda (née Spencer) Briggs (aka Aunt Mandy) and their oldest child was Richard Anthony*. Richard Anthony died at age 27 when his child, Anna Maria (pronounced Mar-eye-ah) was only a year old. The Spencers raised Anna Maria so she grew up with Esther Amanda as they were only eight years apart. They grew up like sisters. Tell me more about your grandfather, John Johnson Spencer. Audrey: John Johnson Spencer, my grandfather, died in our house in Coventry. He was sick all his life because of his treatment when he was a prisoner of war. I was 12 years old when my father sold the farm and we moved to the Coventry house. 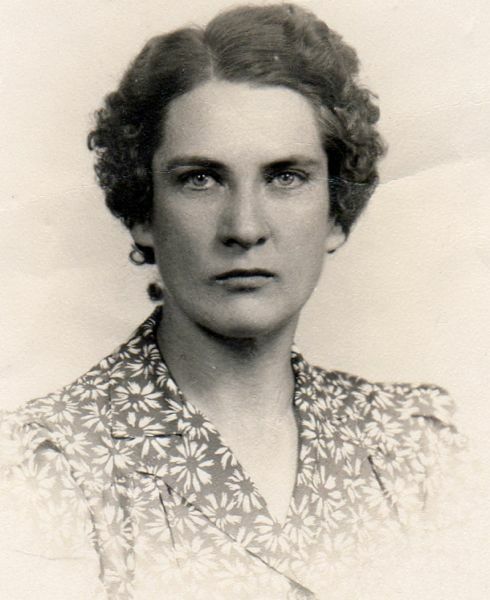 My grandmother, Anna Maria died much earlier than John Johnson Spencer. Aunt Mandy died in 1927, I think. What do you remember about your grandparents? Audrey: My father’s mother, Anna Maria (pronounced Anna Mar-eye-ah), came to stay with us. I was quite little and they talked about her all the time. I was little but I know what was said. Grandmother died and the cofﬁn was in the front room. I was quite little and couldn’t see up in the casket. I knew it was my grandmother. I was big enough to understand. 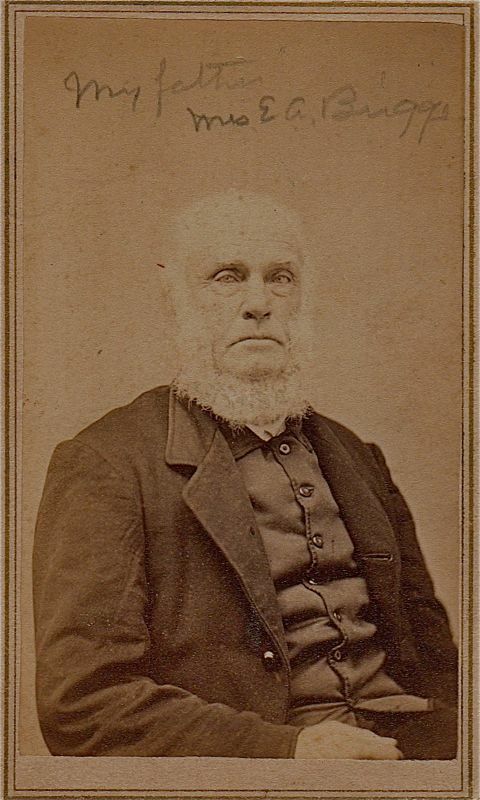 My mother’s father, Charles Vaughn*, was tall and always wore dark boots. His brother Christopher was tall and thin also. They are buried at the Vaughn Historical Cemetery in the Fairground by Barton’s Corners. The Vaughn homestead was there where the Fairground used to be. They had a blacksmith shop on our land. I could always hear banging from the shop. It must have been my grandfather Vaughn. When my mother’s mother died, I remember going over to her house and the casket or bed was behind the door. I never remember seeing my great-grandmother. What do you remember about Anna Maria’s mother? Audrey: Anna Maria’s mother, Ann Almy Tarbox Spencer, was kind of a nut, a high ﬂyer. She was always going places and gallivanting around. 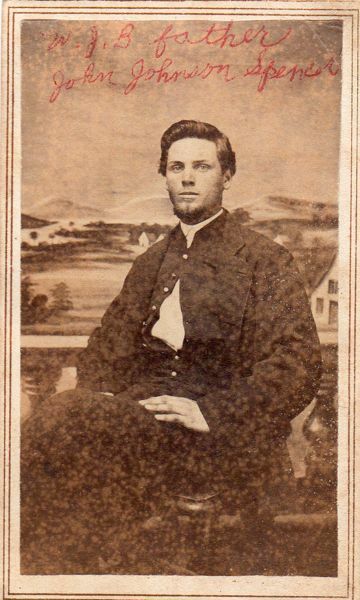 When Richard Anthony Spencer, Anna Maria’s father died at age twenty-seven years, Richard Anthony’s sister Audra took care of Anna Maria (pronounced Anna Mar-eye-ah). Richard Anthony’s sister, our Aunt Mandy, and Anna Maria were good friends as there was only eight years difference in their age. How is it that Anna Mirah* has Anna Maria written on her tombstone and in John Johnson Spencer’s Civil War pension plan, her name is also spelled with a “Y” as Anna Myriah? Audrey: I never remember seeing it with a Y! All I ever heard was Anna Mirah. The writing on stones was not professional. I don’t ever remember seeing a “y”, I was 1-1/2 years old when she died. I walked around the casket. I couldn’t see in but I walked around it. Who became “little sick gramma”? 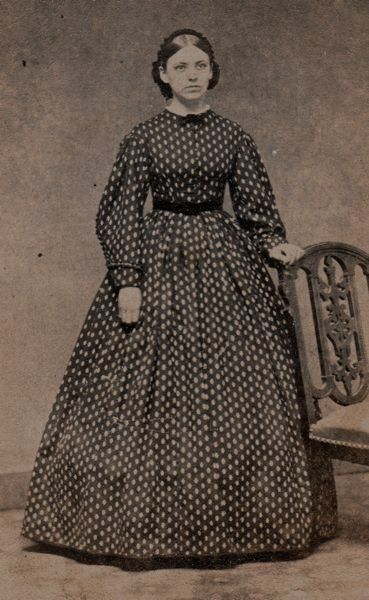 Was it Anna Mirah or her mother, Ann Almy Tarbox? Audrey: Oh, I can’t remember now, but it is all written down somewhere. How is Violet related to us? Audrey: Her aunt married Joseph Jason Spencer who was a grandson of Deacon* Richard. Joseph Jason was an angel, but all the Kettelles thought he was lazy.